2 components: filling compound with hardener, spatula, sand paper for repair of ceramic. For professional, money-saving repairs when ease and perfect results are important. 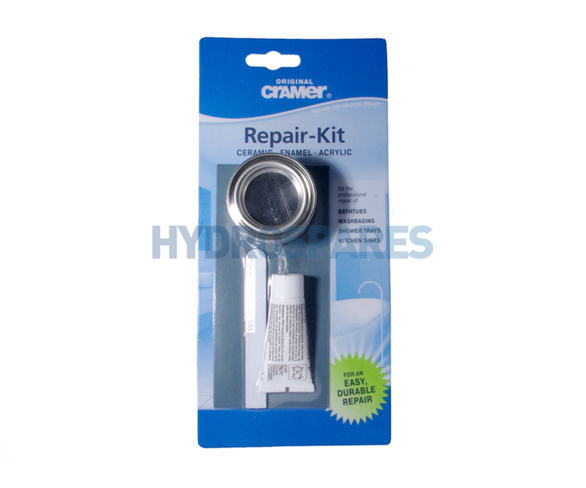 Please look at our Cramer Bathroom & Kitchen Repair Spray to view available colours. PERFECT,EASY TO FOLLOW INSTUCTIONS, FOR ENAMEL OR ACRYLIC METHOD FAST DRYING. What colour is the repair filler when dry? Good Afternoon I have a chip on the outside of my new acrylic/resin sink. Would this do the job? Thank you. Yes this is the blank filler kit only, so would be used to fill in the chip. You would then need a repair spray in the appropriate colour to cover over the repair. If the chip is very small then you might get away with a touch up pen which contains a small amount of filler and top coat in one.